This article is the third of a series of four. The following provide historical background: Part 1 on late 19th and early 20th century history, and Part 2 on Japanese occupation. Part 4 is an in-depth analysis that attempts to shed light on the part Korea plays in contemporary geopolitics and the shakeup of global power. The Korean War began in June 1950 after the North Koreans launched a general offensive to capture the south. The country was cut in two since the conclusion of World War II, a division initiated by the US and agreed upon by the USSR. The south fell under the influence of the US, while the north was under that of the USSR. The division was supposed to be temporary before unification under one state. Wars are also supposed to end. Neither has happened. Korea is still divided and a peace treaty has yet to be signed though conventional warfare has ceased. The highly destructive early period of war later settled into a cold war of fear, insecurity, threat, propaganda, and hurt for Koreans on both sides of the dividing line. After World War II, South Korea underwent a period of civil unrest because of the unpopularity of its official governing personnel and in support of hopes for change following the country’s liberation from Japanese occupation. The state institutions and those individuals who commanded them furthered their established power and successfully defeated organised opposition. Notably, this was accomplished with the help of mass arrests, mass executions, and terror over key sectors of the general population. Therefore, many of the individuals and institutional bodies that had previously ruled Korea on behalf of the Empire of Japan found direct or indirect continuity of rule after Japan’s World War II defeat. This had direct bearing on the Korean War. The South Korean armed forces suffered from low morale due to their immediate experiences with repression of the local civilian population and because of the great portion of the political and military leadership’s ties to Japanese colonialism. A significant portion of the North Korean military was composed of veteran fighters who were still in combat, battling on the side of the Chinese Communist Party in that country’s civil war against the very soon to be (mostly) defeated Kuomintang. Their morale was relatively high after the defeat of Japan, their political institutions’ command of North Korea, communist success in mainland China, and the likely positive impression North Korean land reforms made on the mass of their fighting forces. The South Korean military was not as well equipped as that of the North. Once the Soviet Union’s army withdrew from Korea, it left behind a small but significant number of such things as tanks and war planes. These were then in the possession of the North Korean military. It appears that both the US and the USSR wished to avoid a civil war from erupting on the peninsula2. However, the northern and southern governments both seem to have been increasingly keen to precipitate an open general war, perhaps by baiting and taunting the other side into the sort of aggression that would legitimate a ‘defensive’ invasion. So, the country’s ruling elites were bracing for civil war. The South was militarily weak, therefore it sought assurances of direct US support for an invasion of the North by the South, or that the US would militarily intervene in case the South was invaded. Existing evidence heavily suggests that the US consistently opposed the outbreak of war despite their political support of South Korea. Numerous military skirmishes took place between the North and South Korean forces in 1949. There was much tactical maneuvering for military position and political leverage. A hot war finally broke out on 25 June 1950 after North Korean troops made a dash for the South and nearly succeeded in taking the whole thing over. It’s hard to say what either side was exactly thinking. However, some aspects are more or less evident: the North hoped that a quick thrust southward would make short work of their militarily weaker enemy, while the South may have hoped that a provoked war by the North would force US involvement. One week before the war, US diplomat John Foster Dulles made a visit to the capital city of Seoul and to the dividing line between the two Koreas (the 38th parallel). He met with Rhee Syngman, who was then president of South Korea. Rhee was born in Korea in 1875, and had agitated against Japanese influence and in favour of Korean independence. He was jailed for such activities. Once released from jail, in 1904, he moved to the US where he made residence until 1945, save for a brief return to then Japanese occupied Korea. He maintained an active political life within his years abroad. After the defeat of Japan, Rhee was hurriedly flown to then occupied Japan aboard a US military airplane despite disagreements of policy on the subject between institutional factions within the US (1945). There, he met with general Douglas MacArthur, who commanded over Japan, and was finally flown to Korea in the general’s plane. In 1948, he was elected to the office of president of the Republic of Korea (South Korea). The leadership of the Right… is provided by that numerically small class which virtually monopolizes the native wealth and education of the country. Since it fears that an equalitarian distribution of the vested Japanese assets [what remained of colonial capital] would serve as a precedent for the confiscation of concentrated Korean-owned wealth, it has been brought into basic opposition with the Left. Since this class could not have acquired and maintained its favored position under Japanese rule without a certain minimum of “collaboration,” it has experienced difficulty in finding acceptable candidates for political office and has been forced to support imported expatriate politicians such as Rhee Syngman and Kim Koo. These, while they have no pro-Japanese taint, are essentially demagogues bent on autocratic rule3. Upon meeting with Rhee, Dulles was pressed upon to give US support for a general South Korean offensive against their northern enemy. By all appearances, the US maintained its opposition to such a venture. Similar statements by South Korean leaders were heard before, and it’s difficult to judge what the North Korean leadership thought about it. However, whether the North genuinely felt threatened or not by the situation, they launched an attack upon the South a short week later. At the very least, they could point to it as legitimation for a broad assault, one that northern and southern leaders seemed to want to take place4. Things went well for North Korea, in the beginning. South Korean soldiers mutinied and deserted. Perhaps it was due to the unpopularity of military commanders and the government. Certainly, they lacked quality armaments and were not well trained. The northern forces, on the other hand, had superior equipment and many of their soldiers had experienced combat in the Chinese civil war. South Korean senior commanders retreated in haste and left chaos in their wake, breaking lines of communication and compromising the chain of command due to absence of leadership. Things only got worse for the defending forces after president Rhee fled the capital city of Seoul. The south was under the purview of the US, and after urgent deliberations the Americans decided on a swift military response. 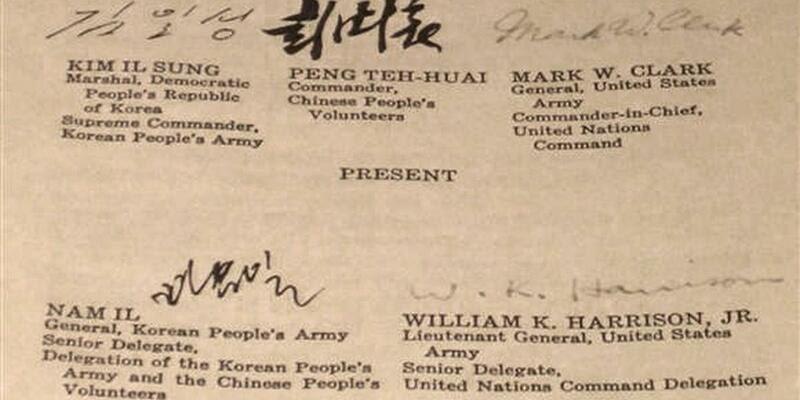 On 27 June, the US received United Nations approval to defend South Korea. The situation was rather complicated for the US since they were simultaneously engaged in military activity in nearby Taiwan. They dispatched the Seventh Fleet to block Chinese communist forces from capturing the last holdout of the Kuomintang in Taiwan. The division of China between the mainland People’s Republic, and the island Republic persists to this day: a remainder of that civil war. The People’s Republic of China complained of this as armed foreign intervention in their internal matters. The Republic welcomed it. Interestingly, the Soviet Union chose not to participate in the UN Security Council vote regarding the Korean War. They could have vetoed it, but chose not to. The US quickly dispatched troops to assist the South Korean government, joined by smaller numbers of allies. The war continued to go badly for the South, and the US. They were pressed against the wall by northern forces, losing battle after battle. By July, South Korea had nearly fallen. They were losing despite outnumbering the enemy. The US and South Korean forces had 92,000 troops (47,000 of them American), while North Korea fielded 70,000 troops5. The UN and South Korean forces were harried along the flanks by guerrilla armies. This resulted in confusion and a certain distrust of local South Korean populations as potential enemies. Virtually any village suspected of harboring or supporting guerrillas was burned to the ground, usually from the air. Furthermore, cities and towns thought to be leftist in inclination were simply emptied of their population through forced evacuations. All but 10 percent of civilians were moved out of Sunchon, Masan was emptied of tens of thousands of citizens, “all civilians” were moved out of Yechon. Amid a threat that “the leftists and Fifth column, living in Taegu, are conspiring to create a big disturbance,” and with the perimeter under great strain, vast numbers of Taegu citizens were evacuated for fear of “an uprising.” By mid-August, many of these removed citizens were concentrated on islands near Pusan, forbidden to leave6. The tide of battle did eventually shift. In autumn, the North Koreans were pushed back to the line demarcating the country’s division. The US command decided to press on and entered the north. By that time, US, South Korean, and allied forces heavily outnumbered the North. They also had more and superior armaments. The People’s Republic of China had aborted plans for an attack on Taiwan thanks to US fleet intervention. However, in October 1950, they entered the Korean War instead. They justified the war as against aggressors who had involved themselves in the Chinese civil war, and that they wished to support fellow communists (of North Korea) who had fought alongside them in that same civil war. General war was waged until 1953. The threat of nuclear war was even made, when in May and June of 1953 the US sent signs that they would be prepared to launch nuclear attacks against China unless the war came to a close7. Concrete preparations for the possible use of nuclear bombs were made before then as well, but these were not made public at the time and details of related operations became public only later. Unsurprisingly, the knowledge that nuclear attack against North Korea and China were under consideration have left an impact to this day. An armistice was signed on 27 July 1953, putting an end to open hostilities. However, no peace treaty was signed, and the peninsula is still officially in a state of war. South Korea suffered some 1,300,000 casualties, 415,000 of them dead. North Korea had 2 million casualties (I’m uncertain of the number of dead). The US had about 129,000 casualties, nearly 37,000 of them dead. China is estimated to have lost about 900,000 to the war. UN allies had 16,500 casualties, 3,000 dead. The material loss was far greater in the north due to US and United Kingdom dominance of the skies, from which they were able to drop bombs. The material destruction was intended to limit the economic and industrial capacity of the North, to subdue its people, or force the populace to turn against their leaders. According to Cumings, 75% of the city of Pyongyang (the capital) was destroyed, 65% of Chongjin, 80% of Hamhung, 85% of Hungnam, 95% of Sariwon, 100% of Sinanju, 80% of Wonsan9. The two Koreas are countries struggling with the consequences of colonisation, civil war, and international intervention. They must also live with and participate in the unfolding of international power relations that make and break the living political history of the region, while their fellows on this ceaseless journey are for the most part more powerful than them. In the decades that followed, the South suffered from episodic political repression to keep some rebellious elements of the population in line, punctuating their history with dictatorships. The recent democratic state has officially tried to come to grips with some of the atrocities committed as well as with the complicity of many among its elite in support of Japanese occupation. They initiated a Truth and Reconciliation Commission for this purpose to investigate and address some of the outstanding cases (with some limits upon its scope, see previous article for more information). The country remains under US influence, with war-time command of its troops under official US command. The US has major military bases in the country, with nearly 25,000active duty personnel. The country is effectively a US protectorate, and is highly dependent on this foreign power in any peace accord with the North. North Korea is isolated from the main body of the international economic system and its citizens live in a society molded by a patriarchal and authoritatively moralising ruling elite that has effectively, if not formally, established a hereditary leadership. Despite a brief but notable ‘post’ war period of economic growth, they have suffered horrendous economic collapse that has resulted in agricultural and industrial disaster. Their access to international supplies are pinched after the fall of the Soviet Union, crippling key sectors of their economy that were interdependent with those of the Soviet Union. It should be clear, that the past century of Korean history has been coloured by foreign interventions, domestic political tension over the distribution of wealth and power, and Korean struggles over identity as well as over the shape of sovereignty in practice. For in-depth historical and cultural background on Korea, read Bruce Cumings’ books: The Korean War: A History, Korea’s Place in the Sun: A Modern History, and North Korea: Another Country. Also see US major general William F. Dean’s account of his impressions while in North Korean captivity during war with that people, written in the book, General Dean’s Story. 6. Bruce Cumings, The Korean War: A History. (Random House Publishing Group: 2010) Chapter 1: The Course of the War, para. 39. Quotes he makes within this extract are from multiple sources: National Records Center (NRC), Record Group (RG) 338, Korean Military Advisor Group (KMAG) file, box 5418, “KMAG Journal,” entries for July 24, Aug. 8, 1950; handwritten “G-3 Journal,” July 1950; Appleman (1961), 478; New York Times, Aug. 17, 1950; NRC, RG349, box 465, CIC report of Aug. 17, 1950. 8. Bruce Cumings, The Korean War: A History. (Random House Publishing Group: 2010) Chapter 1: The Course of the War, para. 80. Cumings got these figures from the Encyclopaedia Britannica.